The Cloak of Visibility: Foofaraw, Jangles and Clanks. 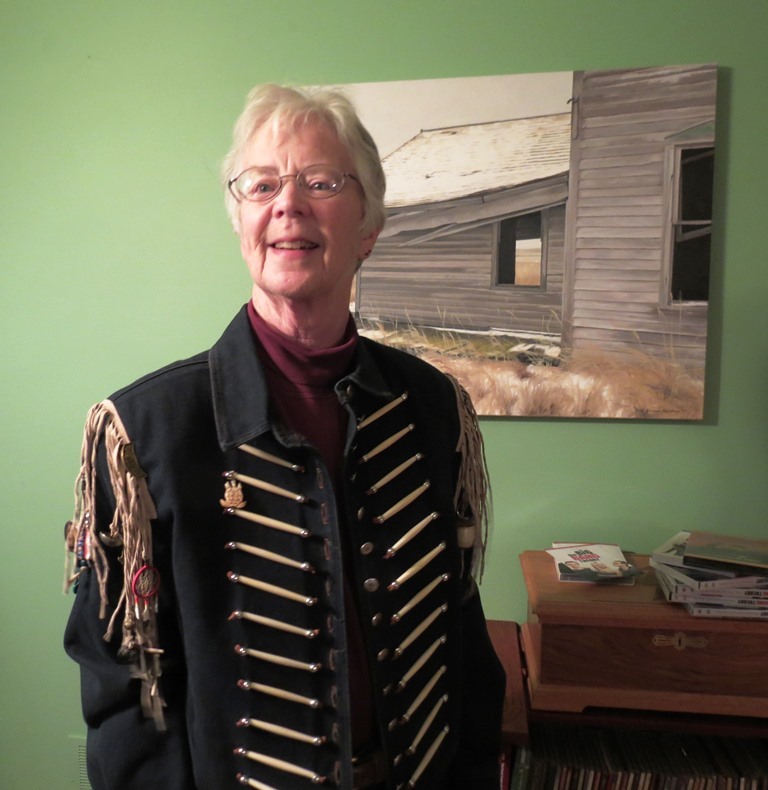 Linda M. Hasselstrom, January, 2015 all tricked out in her fringed jacket. The fringed jacket that I wear to The National Cowboy Poetry Gathering was a gift from my partner, Jerry, and has become a weighty, but necessary, part of my performance, my Gathering armor. The jacket was made by Double D Ranchwear as part of a collection apparently inspired by Western and Indian styles. In its original form, the jacket was probably inspired by military action on the Northern Plains. It’s heavy blue denim, cut like a military jacket, but decorated with fringe and a bead breastplate. The beads down the front echo an Indian hair-pipe breastplate. Hair-pipe beads are tubular, and may be from a half-inch to as much as four inches long; mine are three inches long. Usually they are tapered at the ends, with a center hole. Nobody seems certain when and where hair-pipe beads were first used and made, but archaeologists have found shell ones nearly 4,000 years old, probably made in coastal regions and dispersed through trade. After about 1624, hair-pipe style beads were made of glass, brass and silver, as well as horn and bone, mostly in the eastern part of what is now the U.S. The beads were particularly popular between 1880 and 1910. By that time, the hair-pipe breastplate had been adopted by Indian tribes west of the Rockies and were also worn by tribes in the northwest. They are still used in powwow regalia in chokers, breast plates, earrings and necklaces worn by both men and women. Little information is available on how the beads were made, but they were probably drilled with a rotary, belt-powered drill and shaped on a lathe. Some beads are still made of horn or bone, and may be black, white, or decorated in a variety of ways. Cheaper plastic ones are also available. 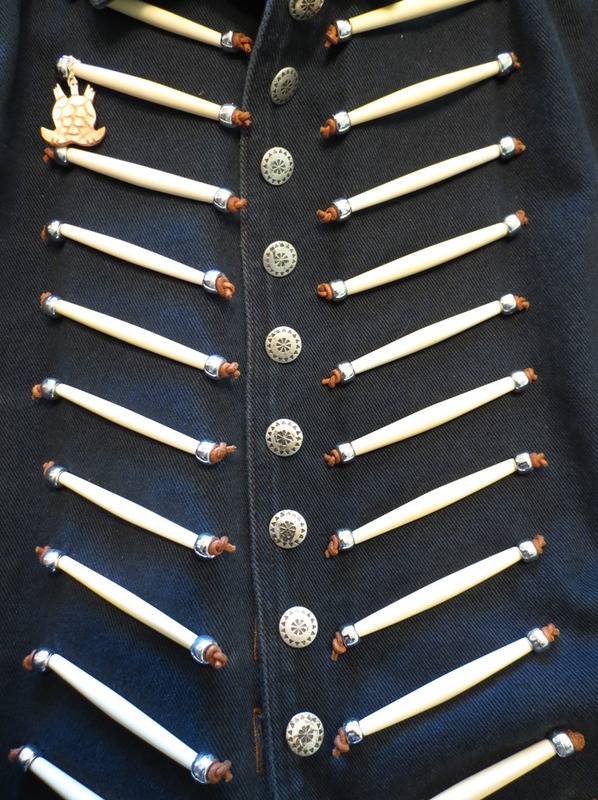 My jacket may recall the fact that Indian warriors sometimes picked up military clothing after a battle, and adapted it to their own use; the hair pipes down the front would function as both a shield and as decoration. Fringe also adorned the buckskin clothes worn by fur trappers and traders in imitation of Indian clothing, but it wasn’t solely decoration; it helped shed rainwater, as well as helping a garment to dry faster because the fringe acted as a series of wicks to disperse the moisture. A buckskinner might also use a piece to tie up broken gear. So the jacket’s original style is a combination of American Indian and military influence, which appeals to me as symbolic of this prairie where I live: occupied by Indians who were chased off by the military, and then adopted by people like me who don’t fit willingly into a particular mold. When I was in buckskinning (reenacting the beaver-trapping era of the 1830s with muzzle-loading rifles) with my second husband, George, we collected a considerable number of accoutrements. I have muzzle-loading rifles, clothing of the era, and plenty of what we buckskinners called “foofaraw”—jewelry and other decorative objects. 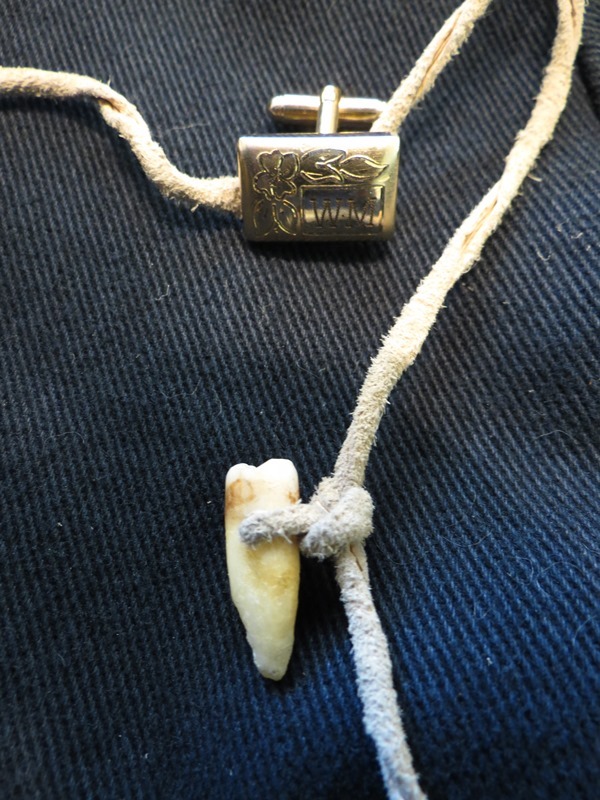 Some of the foofaraw tied in the jacket fringe– George’s tobacco box made of horn, George’s grizzly bear claw earring, a couple turtles (of course! 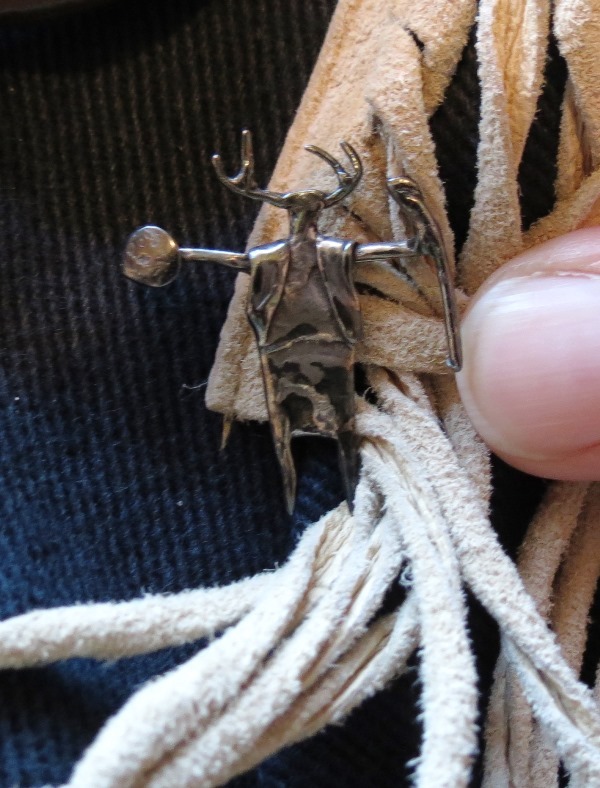 ), a tiny dream catcher, and a Harley Owners’ Group pin in honor of Jerry. I realized the jacket wasn’t quite “cowboy” but I’ve never considered myself to be purely a “cowboy” poet. I like and respect many cowboy poets, but have many other interests, including the historic era of the beaver trapper where a white woman would not have been welcome or comfortable. I own western clothes—boots, hat, boot-cut jeans—but don’t wear them full-time. Depending on my task for the day, I may dress like a rancher or like a professional businesswoman. So in a spirit of irony, I began turning the jacket into something that was neither cowboy nor buckskinner attire: a War Shirt to bolster my courage when I have to stand up in front of people to speak. I realized that without George, I wasn’t likely to attend many buckskinning rendezvous, so I tied souvenirs from my buckskinning life onto the fringe. I wore the jacket the first time as armor; nervous, I wanted familiar things around me. I also wore my buckskinning hat, a broad-brimmed felt with a beaver fur hat band, and talked about being one of the muzzle-loading reenactors. I was also curious about the reaction of these cowboy folks I didn’t know. Would the folks at the Cowboy Poetry Gathering be offended by my failure to adopt cowboy attire? 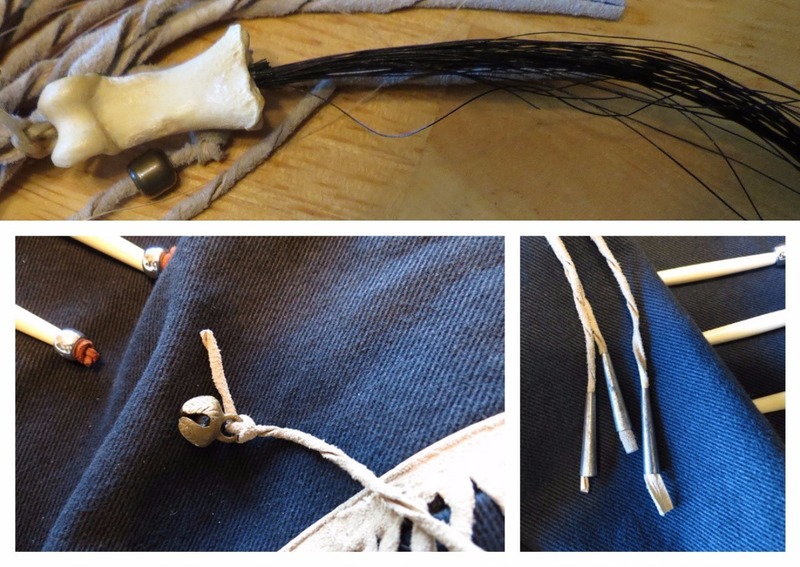 The tiny imitation scalp lock is made of deer bone and horse hair. Brass bells and tin powwow jingle cones add to the jacket’s jangle. To honor Jerry, I placed a HOG (Harley Owners’ Group) pin at the shoulder. As balance, on the other shoulder is a pin featuring a woman with a horned headdress holding a shield in one hand and a sword in the other: a militant feminist symbol. Somewhere is a miniature dream catcher given me by a former student when I visited him in the penitentiary. Among the fringe hang several millifiori glass trade beads made with flower designs in Venice, and Chevron glass trade beads, watermelons, and other beads that have been used for several thousands of years as trade items. Some of my beads are old enough to have been used during the fur trade days of the 1830s on the plains. My Cloak of Visibility carries memories I can’t even articulate. The jacket jangles and clanks, and carries symbols of many different parts of my life. I’m not sure how the average cowboy poet views my jacket, but at least one man understood and appreciated its humor and symbolism. Wally McRae, the greatest living cowboy poet, raised his eyebrows the first time we were onstage together and said with a smile, “That’s quite a rig.” I wasn’t entirely sure how he meant that until the next year, when he brought me one of his cufflinks to tie on. 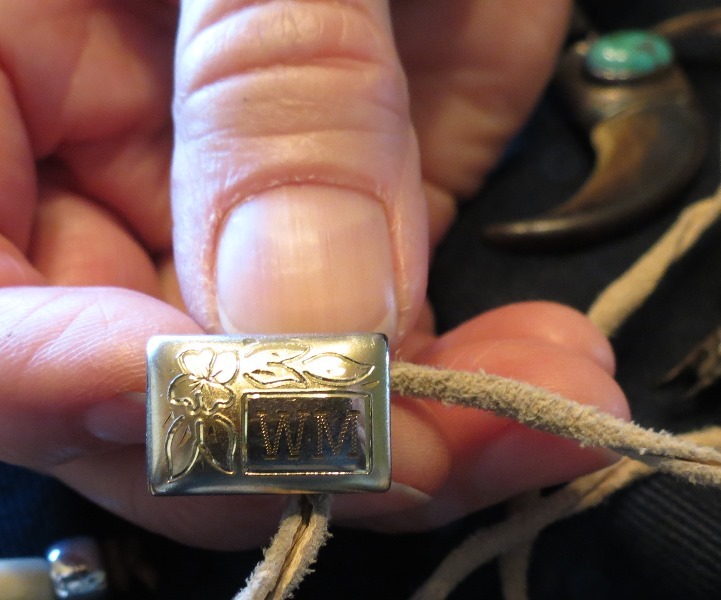 When I mentioned the cufflink while performing, the Western Folklife Center archivist asked if I’d will the jacket to the Center when I’m finished with it. I suspected he was more interested in Wally’s cufflink than in my jacket. This year, when I mentioned the cufflink exchange onstage, Wally told me that he’d lost a tooth at a recent gathering. He promised to bring it to me next time we meet, and if he does, I’ll find a way to wear it. More good memories will follow me. Wally McRae’s tooth now hangs next to his cufflink. The Wally McRae Fang now hangs next to the Wally McRae cufflink on the jacket’s left side, where my heart is.